With 4G providing the fire power, data volumes are exploding across the mobile environment, and communications service providers (CPSs) are in danger of being overwhelmed by the assault of Big Data on their often struggling networks. The onslaught of data already has reached the point at which one operator reports receiving and interpreting 40 billion records a day, estimating that volumes will rise to 100 billion by the end of this year. Moreover, research firm IDC predicts that, by 2020, digital data will swell by a factor of 300. Such enormous amounts of data can be daunting if we mistakenly think of them in the same way we consider a continuous blast of water from a fire hose. Since every drop of water in the stream is pretty much the same as all the others, we find no benefit in analyzing the content of the blast; our tendency is simply to try to restrict it in some way. Telecommunications data, however, is not composed of molecules, but of messages. Every single element of the stream is different and can offer immense marketing insight into consumers’ thinking, preferences and intentions. In addition to battling the stream, CSPs should be looking for ways to welcome the arrival of all this information and mining it for the benefit of subscribers and providers alike. Conversely, doing nothing with the data that barrels through the network means operators will spend increasing amounts of time and budget to store data without any immediate offsetting benefit. Using the data as an asset, however, can have tremendous value. Subscriber behavior: Operators have at their fingertips a potential goldmine of personal data relating to presence, location and preference. Networks should focus on this multi-dimensional information related to subscribers’ interactions with the services and applications they use. Services and apps: With deep packet classification, CSPs can see each of the unique services that go across their mobile broadband network for each customer. This capability makes it possible to spot traffic issues and real-time state-of-play data, helping identify, predict, alert and isolate problems as they occur. Technologies used: The mobile environment is evolving so that services are becoming more integrated, fragmented and often beyond the control of operators. Therefore, providers who want to successfully manage new technologies, protocols and devices need analytics across both legacy and next-generation technologies. Network performance: Network components are becoming functionally more complex, with a need to serve multiple technologies, through a variety of vendors and standards. The key to efficiency is in ensuring that the network maintains a 100% run rate. Core network applications are available that reduce outages, accelerate resolution time frames and improve network quality. These applications can be managed by one end-to-end system. With such a comprehensive outlook, operators gain the network intelligence required to see more than simply the data that flows through the pipe; they can learn its sources, destinations, intent and purposes. That knowledge imparts real meaning and value to the data. The data will not analyze itself, however it must be heeded, correlated, located and contextualized. Operators must realize that merely attempting to sort out indicative trends through macro-level information is not enough if they expect to fully interpret and monetize available data. Rather, they must approach the data on a micro level and assess it through the lens of the four segments listed above. This methodology means CSPs never miss an opportunity because of events occurring in parts of the network that they could not see. 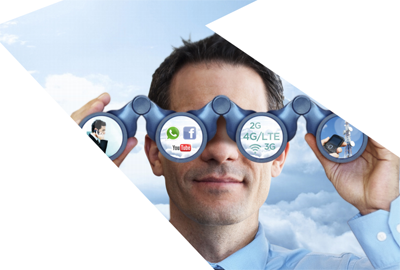 Additionally, it brings new capability to the telecoms model, offering the same agility as that of OTT players. Full visibility into the network is derived from real-time, end-to-end data collection and analysis that exposes hidden issues while providing unparalleled breadth and depth of insight. The good news is that the technology to do this already exists and can be implemented with the help of a telecoms intelligence provider. Technology for the four-dimension world of valued data allows operators to follow and analyze every path of the data journey, creating the survival strategy for the modern age and a competitive advantage in the LTE environment. Without it, the heightened demands of LTE will drive glitches to become inefficiencies, leading to complaints and time-consuming drains on resources, ultimately generating churn and lost opportunities for revenue. Lyn Cantor rejoined Tektronix Communications in 2011 from Visual Network Systems (VNS) where he was Senior Vice President and General Manager. Prior to his term with VNS, Cantor served as Vice President of Worldwide Sales, Service and Marketing at Tektronix Communications. Over the course of his 27-year career, of which 14 years have been with Tektronix Communications, Cantor has held various vice president positions in Americas sales, global channels, product management and marketing, in addition to having general manager responsibility. Tektronix Communications is uniquely positioned as the communications industry’s first Telecommunications Intelligence Provider (TIP) offering both service assurance and monitoring and network intelligence solutions that cover all four dimensions of the service provider’s environment: subscriber behavior, the services and applications they consume, the network environments they occupy and the technologies that enable them. Our comprehensive set of assurance, intelligence and test solutions and services support a range of architectures and applications such as LTE, HSPA, 3G, IMS, mobile broadband, VoIP, video and triple play. Tektronix Communications is headquartered in Plano, Texas. Visit us online at www.tekcomms.com. Huawei introduced a new enterprise-class switch for supporting key industry trends in cloud computing, bring your own device (BYOD), software-defined network (SDN), internet of things (IoT), and big data related analytics. 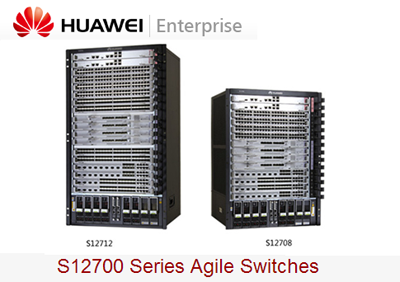 The Huawei S12700 is a family of campus switches designed for software-defined networking architecture. 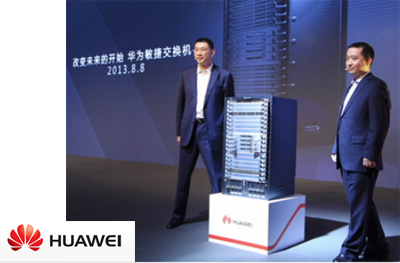 It is powered by Huawei's own Ethernet Network Processor (ENP) for full programability. Huawei's Packet Conservation Algorithm for Internet (iPCA) supports hop-by-hop monitoring of any service flows. It runs Huawei Versatile Routing Platform (VRP), which provides high-performance L2/L3 switching services as well as rich network services, such as MPLS VPN, hardware IPv6, desktop cloud, and video conferencing. Huawei also cites a number of reliability technologies including in-service software upgrade, non-stop forwarding, CSS2 switch fabric hardware clustering that allows 1+N backup of MPUs, hardware Eth-OAM/BFD, and ring network protection. The Huawei S12700 can provide native wireless access controller (AC) to help build a wired and wireless converged network. It also features native broadband remote access server (BRAS) capabilities and support for large Ethernet frames. "The inevitable trends of broadband services, multimedia, mobility and social networking are shifting the focus of networks from technologies and devices to services, users and experiences,” said Mr. William Xu, Chief Executive Officer, Huawei Enterprise Business Group. “Huawei is committed to customer-centric innovation and open collaboration with the industry, and leveraging our 10 years’ experience in enhancing IP network capabilities to best meet the needs of our customers. With the launch of industry’s first agile network and agile switch that focus on service efficiency and user experience, I am confident that we will change the future of next-generation enterprise networks." As of the end of last month, there were 200 LTE networks in commercial operation in 76 countries, according to GSA, the Global mobile Suppliers Association. 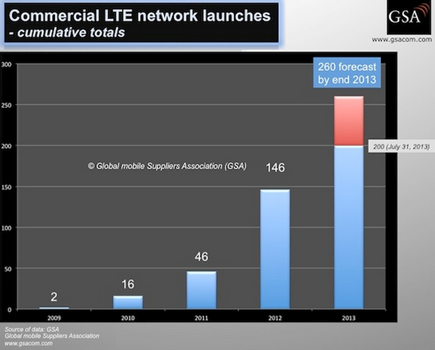 A total of 54 operators launched LTE service in the first 7 months of 2013. LTE service has been introduced to 12 new markets so far this year: Chile, Iceland, Iraq, Lebanon, Malaysia, New Zealand, Paraguay, Qatar, Spain, Thailand, US Virgin Islands, and Venezuela. Full details of LTE market developments including network deployments and service launches worldwide will be published in the next update of GSA’s Evolution to LTE report, which will be available soon. The U.S. Food and Drug Administration granted clearance for Verizon's Converged Health Management, a remote patient-monitoring medical device that provides clinicians with access to up-to-date patient data from connected biometric devices so they can more efficiently monitor and manage patients from their home, or when they are on the go. Verizon said its new solution is powered by the company's HIPAA-ready cloud. "Verizon is committed to improving the dynamics of the U.S. healthcare system," said Dr. Peter Tippett, chief medical officer and vice president, Verizon Innovation Incubator. "By leveraging our mobile health expertise, HIPAA-ready cloud, 4G LTE wireless network and leading security solutions, Verizon is uniquely positioned to drive innovation in healthcare. Converged Health Management will accelerate focus on care management through mobile technologies as patients increasingly take more responsibility for their health. 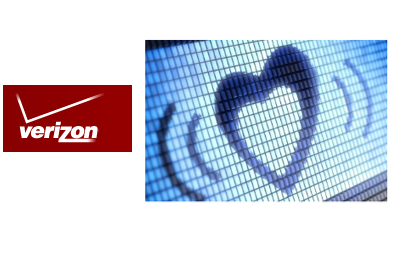 Verizon's Converged Health Management solution will be commercially available in late 2013. 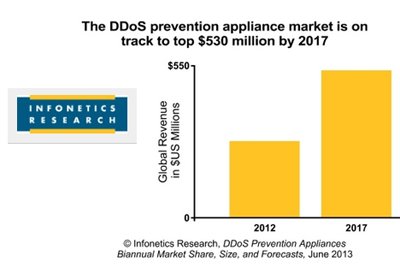 DDoS prevention for mobile networks will see strong growth, with a 25% CAGR from 2012 to 2017, thanks to the transition to IP and data, massive increases in capacity, and a new role as a juicy and highly visible target for attacks, according to a new report from Infonetics. "DDoS prevention appliances are the first line of defense against brute-force attacks like those we saw aimed at U.S. financial institutions last September, and most service providers and large enterprises are investing heavily in them,” notes Jeff Wilson, principal analyst for security at Infonetics Research. “With the number, size and coverage of DDoS attacks on the rise, we expect revenue for DDoS prevention solutions to grow in the healthy double digits through 2014." With its acquisition of Webscreen, Juniper has stepped into the DDoS market, joining other established networking/security players (including F5 and Fortinet) looking to siphon business from market leader Arbor. Hurricane Electric has opened two new points-of-presence: Global Server Centre located at 167 Lombard Ave, Winnipeg, Manitoba, Canada and DataHive, located at 840 7th Ave, Calgary, Alberta, Canada. The facilities will provide high speed IPv4 and IPv6 Internet connectivity through 100BaseT, 1GigE, 10Gbps, and 100GE service. Hurricane Electric also operates at Equinix in Toronto, and Cologix in Vancouver and Montreal. 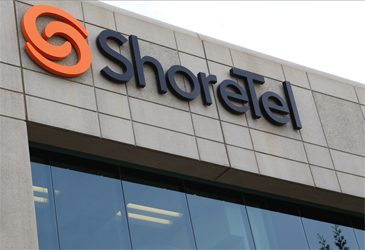 ShoreTel reported record quarterly revenue of$85.6 million, an increase of 9 percent sequentially 9 percent year-over-year. Non-GAAP net income for the fourth quarter of fiscal year 2013 was $3.4 million, or $0.06 per share which excludes stock-based compensation charges, amortization of acquisition-related intangibles, other charges and related tax adjustments. For its full 2013 fiscal year, revenue was a record of $313.5 million, up 27 percent from fiscal year 2012. "Fiscal year 2013 showcased the first full year of cloud revenues from our ShoreTel Sky offering, which have been growing steadily over the last six quarters and were up 35% year-over-year in the fourth quarter,” said Peter Blackmore, CEO of ShoreTel. “We reported a very strong and profitable quarter with record revenues of $85.6 million, up 9% sequentially, driven by record premise revenues and the addition of nearly 1,200 new customers in the fourth quarter.” Blackmore continued, “With our continued focus on improving operating efficiencies and sales productivity we drove our non-GAAP operating expenses to 57% of revenue in the fourth quarter. Coupled with the projected growth in our target markets, we are positioned for continued profitability in fiscal 2014." 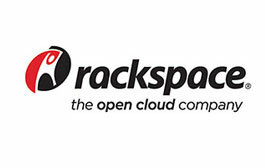 Rackspace posted Q2 revenue of $376 million, up 3.8% from the previous quarter and up 18% from the second quarter of 2012. Net income was $22 million for the quarter, down 18.0% from the previous quarter and down 11% from the second quarter of 2012. Net income margin for the quarter was 6.0% compared to 7.5% for the previous quarter and 7.9% in the second quarter of 2012. Total server count increased to 98,884, up from 94,122 servers at the end of the previous quarter. ShoreTel named Don Joos as its new president and CEO, replacing Peter Blackmore, who announced his retirement in May 2013. Joos joined ShoreTel in April 2011 as vice president of global services, and for the past year has served as senior vice president of business operations. 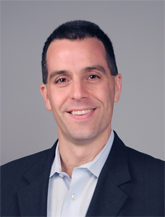 During his time at ShoreTel, Joos has been in charge of overseeing approximately 50 percent of the company operations through the direct management of engineering, R&D, product management, global support and services, IT, quality and operations. Prior to ShoreTel, Joos spent nine years as a company vice president at Avaya and held service and operational roles at an e-commerce startup, Williams Communication Solutions, Nortel Communication Solutions and Marshalls Inc.
Blackmore served as ShoreTel's president and CEO since December 2010. During his tenure at ShoreTel, Blackmore nearly doubled the revenue, scaled global operations and accelerated the company’s growth. Blackmore announced his retirement in May 2013.